New Toyota Prius To Get Solar Panels As "Symbolic Gesture"
Toyota plans to install solar panels on the new Toyota Prius hybrid as a response to a "growing demand for green cars," reports Reuters. The panels will be supplied by Kyocera and would be able to power part of the air-conditioning as a "symbolic gesture" as it's "very difficult to power much more than that with solar energy." Yes, despite solar power not being "seen as a viable solution to power cars," you've got to give the super number one best awesome automaker from the land of the rising sun credit for trying to make that tint of marketing around the brand glow ever more green. More below the jump. First Photos Of The New Toyota Prius! 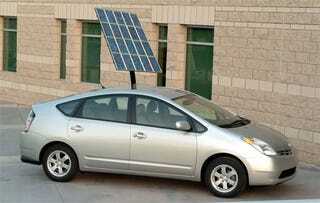 "But solar power is not seen as a viable solution to power cars. Solar panels are expensive due to rising silicon prices and storing energy is difficult, the source said. It was unknown how much the solar panels on the new Prius cars would cost, or how many solar-mounted versions Toyota would build."